The Hague, The Netherlands (dfr.gov.krd) Today Head of the KRG Department of Foreign Relations Minister Falah Mustafa, together with two Yezidi NGOs, submitted a comprehensive report to the office of the ICC chief prosecutor in the Hague regarding the ISIS genocide against the Yezidis. This comes as a follow-up to previous efforts, and this detailed report provides further information. The delegation delivered the detailed report to the chief prosecutor’s office for analysis, with the hope that the ICC will open a preliminary investigation into these crimes on the basis of this supplemental report. Despite the fact that Iraq is not an ICC member state, the court does have jurisdiction over the activities of ICC member state nationals wherever they may commit crimes. It is hoped that this report (the redacted version is linked below) will prompt the ICC to commence its preliminary investigation by demonstrating that the international court has jurisdiction, due to the large number and heinous nature of the crimes perpetrated by ISIS foreign fighters who are nationals of ICC member states. As part of his visit to the Netherlands, the Head of the KRG Department of Foreign Relations met with the Minister of Foreign Affairs of the Netherlands, Mr Bert Koenders in the Hague to discuss bilateral ties as well as recent military and humanitarian developments. Minister Mustafa gave an overview of the role of the Kurdistan Region in fighting the ISIS terrorists and the situation and the needs of the Syrian refugees and Iraqi displaced people in the Kurdistan Region. Reiterating KRG’s commitment to continue the fight against terrorists and to carry on its open door policy towards refugees and displaced people, the KRG Minister called for continued international support. He stated that the scale and magnitude of the challenges are beyond the capabilities of the KRG; the challenges have placed an incredible burden on the government and the people of the Kurdistan Region. The Minister thanked the Dutch government for providing humanitarian and military support to Kurdistan Region and stressed the need to receive further and continued support from the international community. Minister Koenders highly spoke of the role of Kurdistan Region in the fight against ISIS terrorists and in caring for Syrian refugees and Iraqi displaced people. The Dutch Minister reiterated the commitment of his government to continue supporting Kurdistan at both humanitarian and military levels. Both Ministers discussed bilateral ties and areas of potential cooperation in order to increase economic and investment cooperation. 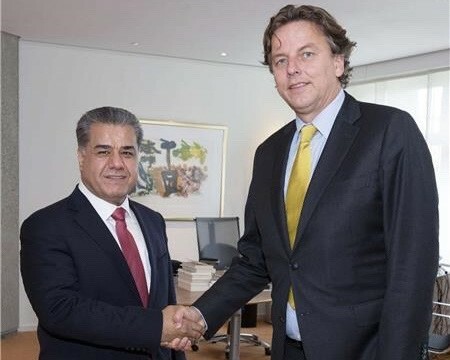 Minister Mustafa also briefed Minister Koenders on the KRG’s efforts to gain international recognition for the crimes committed by the ISIS terrorists against the Yezidi Kurds and other components in the Kurdistan Region and called for moral, legal and political support of the Dutch government. Minister Koenders expressed the readiness of his government to support such efforts and said that the perpetrators of such crimes must be prosecuted to the full extent of the law. Erbil, Kurdistan Region, Iraq (cabinet.gov.krd) – Kurdistan Region Prime Minister, Nechirvan Barzani, yesterday received, US Ambassador to Iraq Stuart E. Jones, and Deputy Special Presidential Envoy for the Global Coalition to Counter ISIS, Brett McGurk, and their accompanying delegation. The two sides discussed the security situation in Iraq in general and Kurdistan Region in particular, and the recent developments in the war against Islamic State terrorist organisation, ISIS. The delegation reiterated the US military support to Peshmerga forces, stressing on coordination between the United States, Kurdistan Regional Government, KRG, and Iraqi Federal Government. Regarding the Kurdistan Region presidency issue, the US delegation expressed its support for continuation of the talks among the Kurdistan Region political parties, urging the need to put the war against ISIS as the first priority of the Region at this moment. 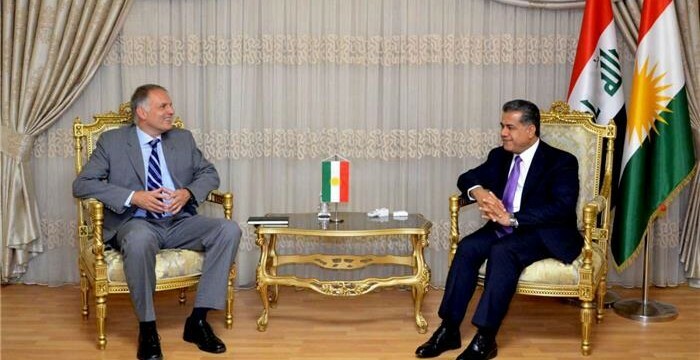 They expressed their hope that Kurdistan Region Political parties will soon reach an agreement. Prime Minister Barzani expressed his gratitude to Ambassador Stuart Jones, and the United States army in Iraq for their support to the Kurdistan Region. He said, however, for the next phases in the war against ISIS, with the aim to liberating the areas under ISIS control, a comprehensive plan, with coalition forces support, particularly US army’s support, for Peshmerga and Iraqi forces, are needed. On the Kurdistan Region presidency issue, Prime Minister Barzani pointed out that the talks among Kurdistan Region political parties are going on seriously to reach a suitable solution in the interest of the people and the stability of the Region. He stressed that Kurdistan Region President, Masoud Barzani and the Peshmerga forces give priority to the war against ISIS. The talks between KRG and the Iraqi Federal Government on finding an appropriate solution for the outstanding issues, the situation in the Middle East and neighbouring countries were also discussed in the meeting. Erbil, Kurdistan Region (dfr.gov.krd) – Minister Falah Mustafa today received a delegation from the Belgian Senate to discuss recent developments. Members of the delegation included Senators Alain Destexhe, Pol Van Den Driessche and Sonja Claes. The delegation commended the political and economic achievements of the Kurdistan Regional Government (KRG) and stated that the purpose of their visit was to get a clear understanding of the events in the Kurdistan Region. Minister Mustafa briefed the senators on the security, humanitarian and financial challenges facing the Kurdistan Region as well as ties between Erbil and Baghdad. The Minister reiterated the commitment of the KRG to continue its open door policy towards refugees and displaced people and to carry on the fight against ISIS terrorists. The minister noted that in order to be more effective at both humanitarian and military levels the people and the government of Kurdistan Region expect further and continuous assistance from the international community. He thanked the international community for their military support but stressed that defeating ISIS requires genuine regional and international cooperation and more commitment from the Counter-ISIS Coalition. “Kurdistan Peshmerga forces are playing a key role in the fight against ISIS and have proven to be very effective, they deserve to be supported,” Senator Destexhe added. Ms. Siham Jabali, the Assistant Head of the DFR, also attended the meeting. Erbil, Kurdistan Region, Iraq (cabinet.gov.krd) – In the presence of representatives of the diplomatic missions and a number of Kurdistan members of parliament and ministers, the Kurdistan Region Prime Minister, Nechirvan Barzani, opened the ceremony of launching the electronic social protection network system, initiated by the Ministry of Labour and Social Affairs. In a speech he made, Prime Minister Barzani, described the Ministry’s project as part of a broader reform policy, which the Kurdistan Regional Government, KRG, plans to implement. It is my pleasure to participate with you all in the commencement ceremony of an important project that has great value for the Kurdistan Regional Government. This is yet another step by the KRG to strengthen the government’s reform efforts, notably its administrative system. This is a step towards establishing a fair, effective system pertaining to salaries, allowances, and financial assistance. To a great extent, it will diminish the possibility of taking undue advantage of the government’s payroll system. This system will greatly facilitate the administration of matters to better serve our citizens. The idea of developing the current social protection network into an efficient, effective electronic system is not new to the KRG. The government has been preparing and developing this project for some time. I take this opportunity to express our thanks and appreciation to Minister of Labour and Social Affairs, Mr. Muhammed Hawdiani, for making this project a priority and bringing it to a stage ready for implementation. The implementation of this project enables all departments in the Ministry of Labor and Social Affairs to be linked directly to the Ministry’s Diwan. This is intended to enable the Ministry to carry out tasks in an easy and smooth manner. On the one hand, this will strengthen the social protection system; on the other hand, it is a practical step towards combating corruption. I would like to express my thanks and appreciation to the Ministry of Labour and Social Affairs, Ministry of Planning, and the United States Agency for International Development, USAID, for their cooperation and team work in developing this important system. We look forward to other KRG ministries and offices successfully adopting and applying key features of this project. The Kurdistan Regional Government is making concerted efforts to conduct important reforms in all sectors by taking advantage of modern systems, cutting-edge technologies, innovative knowledge and expertise in order to reorganize the working of our government. The intention is to bring our administrative and service systems up to levels that are efficient, effective, which meet international standards. Step by step, taking into consideration our resources and capabilities, we will continue to make necessary reforms in all fields. We have a strong will to make reforms and we will continue to do so. We say we will do it step by step because we believe that for reform to be done effectively it needs to be done carefully, with patience and perseverance. We will do reforms in accordance with thoughtful planning and carefully designed programs, not by impulsive action. Reform is not an isolated process independent of other principles and interactions. Reform is a broad and long-term process that relates to many factors. It cannot be seen and realized as a mere decision of the prime minister or the council of ministers to do reform! That is why this process is not as simple as reading it in a newspaper article. It is a process that needs a strong will to make it happen. It needs patience and perseverance until it provides expected results. It is a process that needs short, medium, and long term plans. Such is the project implemented by the Ministry of Labour and Social Affairs. It is anticipated to have positive impact in the near future on our reform efforts by insuring justice for disabled persons seeking benefits from our social protection system. Taking practical reform steps during this time when we fight terrorism and face severe political, economic, and financial challenges has only one meaning, which is that the KRG insists on continuing the reform process because it believes meaningful reform is important to successfully meet the difficult challenges we face. It is about enhancing efforts toward justice and providing more efficient and effective services to our citizens. Reform is a priority on the government’s agenda. All KRG ministers are making reform efforts and many have made good progress. In early 2014 when disagreements with Baghdad over budget and other issues began, the KRG took practical steps to reduce expenditure and increase income. I certainly believe that Kurdistan’s citizens in the near future will see more results of the reforms. I also want to reiterate that this step by the Ministry of Labor and Social Affairs is one of the initial steps of the KRG in the reform process. In the near future the KRG will announce greater steps in this regard. Again, I thank the Ministry of Labor and Social Affairs and the Minister. I wish them continued success. Erbil, Kurdistan Region, Iraq (cabinet.gov.krd) – In August, direct oil export from Kurdistan Region continued despite sabotage and attempted theft on the export pipeline inside Turkey borders, which occurred on 27 July and extended to the first week of August. According to the Kurdistan Regional Government, KRG, Ministry of Natural Resources Oil Export Report, in August Kurdistan Region has exported 14,657,798 barrels of crude oil, an average of 472,832 bpd, through the Kurdistan pipeline network to the port of Ceyhan in Turkey. This is an 8.5 per cent decline comparing to 16,019,090 barrels which were exported in July. The decline, according to the report, was due to nine days of downtime for the export pipeline which mostly occurred at the beginning of the month. Of the exported amount, fields operated by the KRG contributed 10,958,817 barrels, an average of 353,510 bpd, while fields operated by the North Oil Company, NOC, contributed 3,698,981 barrels, an average of 119,322 bpd. In August, the Kurdistan Regional Government delivered a total of 1,579,004 barrels, an average of 50,936 bpd, to the Iraqi State Oil Marketing Company, SOMO. Last week, KRG Ministry of Natural Resources confirmed that the Kurdistan Regional Council for Oil and Gas Affairs expects the first tranche of regular payments to the producing IOCs to be made available during the first half of September 2015. In an earlier statement by KRG ministry of Natural Resources it was urged that as oil export is expected to rise in early 2016, the KRG envisages making additional revenue available to the IOCs to enable them to begin to catch up on the past receivables due under their production sharing contracts. El primer ministro Nechirvan Barzani recibió ayer al ex jefefiscal de la corte penal internacionalLuis Moreno-Ocampo con su delegación para hablar de la situación de las víctimas de los ataques terroristas, especialmente los kurdos yazidí es que fueron y siguen siendo el objeto de ataques brutales por el ISIS. El primer ministro expuso las iniciativas del GRK para obtener el reconocimiento internacional de los crímenes cometidos contra los yazidis como un genocidio e informo a la delegación sobre el trabajo del ministerio de mártires y asuntos anfal en este sentido. El Sr. Moreno-Ocampo expresó su pésame a la comunidad yazidi, el pueblo y el gobierno de la región del Kurdistán, reiterando su apoyo a los esfuerzos del GRK para el reconocimiento del genocidio deYazidi – un caso de crueldad y crimen contra humanidad sin precedentes. El primer ministro Barzani agradeció al Sr. Moreno-Ocampo por su apoyo, señalando que el GRK continuará con los esfuerzos para liberar a los hombres y mujeres yazidi que aún permanecen en cautiverio del ISIS por lo que necesitara todo el apoyo de la comunidad internacional.